The Islanders scattered for their holiday break — some home to Canada, some south to the sunshine — on Tuesday with a little more spring in their steps. The 5-2 win over the reeling Ducks on Monday at Barclays Center was a just reward for a smart, strong game. These Islanders were not feeling too down after the previous three games, all losses in which they mustered just two total goals. Even with the ugly disappearance of their usually solid offense during their first three-game losing streak of the season, they were still positive about how they played — most notably in their own end. Hickey and the Islanders know all about that. The past three seasons, two of which featured playoff appearances, the Isles were in the bottom third of the NHL in goals allowed per game: 21st in 2012-13 (2.83), 28th in 2013-14 (3.18) and 23rd in 2014-15 (2.73). 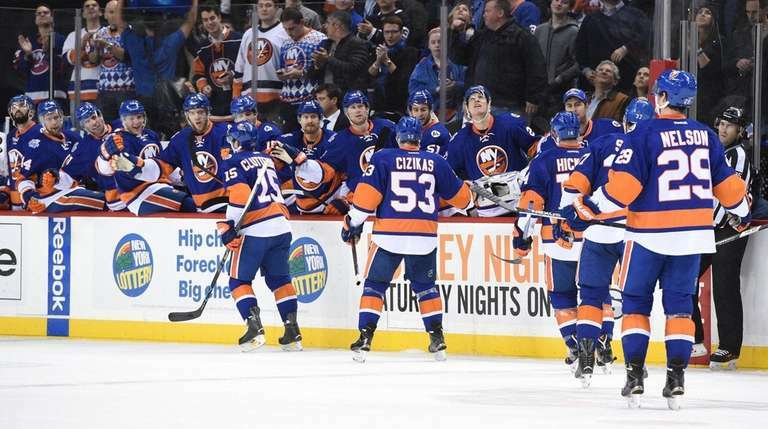 Whether it was poor goaltending, poor defending, poor penalty killing or a mix of all three, the Islanders hadn’t been good enough keeping the puck out of their net even as they grew into a much more formidable team. This season has been a big turnaround. From the strong work of Jaroslav Halak and Thomas Greiss in goal to pretty consistent work by the skaters in their own end to the third-ranked penalty killing unit at 87 percent efficiency, the Isles entered Tuesday’s play tied for third in the NHL at 2.29 goals per game allowed. They are 19-11-5 at the break. Perhaps this is the way the Islanders can get over the mountain and win a playoff round, by setting themselves up for the grinding playoff style with a regular season of goaltending and defense first. Perhaps the days of seeing John Tavares, who broke out with two assists on Monday, vying for the scoring title will be replaced by vying for the William Jennings Trophy, given to the team with the lowest goals-against average. However it goes over the final 47 games, the Islanders feel good about where they sit right now — and how they played to get there.